Don't be shy wearing bold print garments. 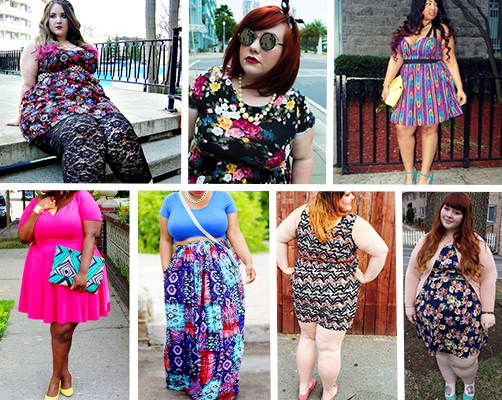 This time I want to speak about plus size girls possible phobia of wearing bright print clothing. Most of weight problem ladies hide their bodies in black and loose-fitting apparel. I have no complaints about that, but listen, sometimes wearing black camouflage isn't the only way out. Sometimes it gets boring, that's why I am here to show you some of the best ways how you can spice up your life by wearing bright and colorful print staples. We all like loud patterns and I've got a nice compilation for you to get inspired by. Let your style be as loud as your personality. Be confident and try on totally bold pattern looks. Have fun with prints what for sure will add extra pizzaz to your unique outfit. I've already shared with you awesome collection of wedding guest dresses. This time I want to show you plus size gowns to wear at various dress code weddings. You are going to see awesome look to wear at black tie weddings, black tie optional, semi formal, festive attire, beach formal and casual weddings. Once you receive this kind of invite card with one of the following dress code phrases, you probably should think over your wedding look. Don't panic, as I am here to share with you a useful guide that will help you make an outstanding look for the upcoming event, by describing each of these dress codes. You are going to find super easy and simple ideas to follow. Anyway, let's begin!